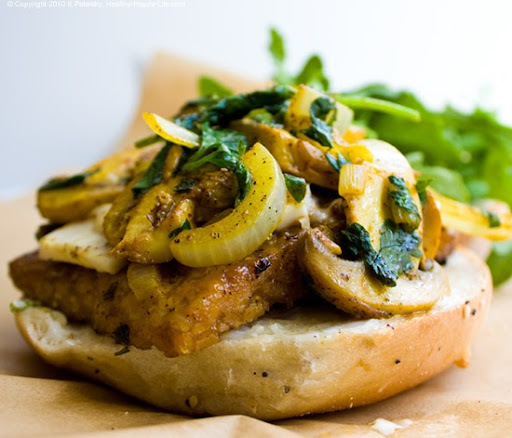 Sunny Mushroom Tempeh Morning Bagel. Gourmet AM. Most people wouldn't dream of firing up their stove top on a weekday morning. 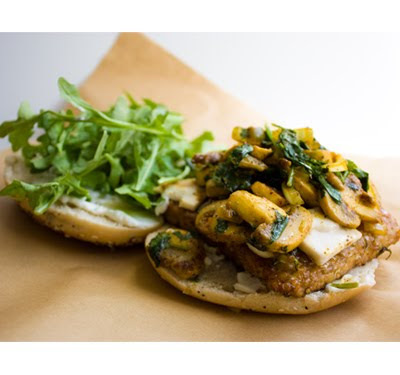 But how about some sauteed orange-saffron mushrooms and maple tempeh on a bagel? No way. Well why not, I ask? Your response: "Too much clean up. No time or energy to "cook" in the morning. I'll get something to-go when I grab my coffee." 1) Breakfast is said to be the most important meal of the day. 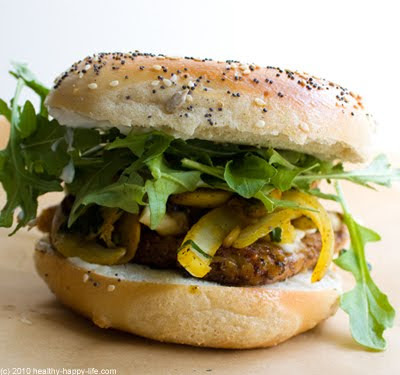 2) By the time you get around to eating or drinking your first meal of the day, doesn't it feel like "lunch" anyways? Why not "brunch it" with something substantial? 3) This gourmet breakfast sandwich took me only ten minutes to make. You can squeeze in ten minutes right? 4) I know you can't stand the thought of doing dishes or cleanup in the kitchen before work, you don't have to! Simply stick your saute pan in some hot soapy water, and by the time you get home the pan will be easy to wipe clean. 1 block tempeh, 8 oz. 1. 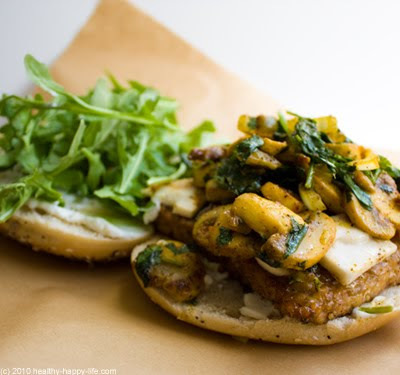 Slice your mushrooms, juice your orange and slice your tempeh. Your rectangle block of tempeh should be sliced in half, then down the center to create 4 think cubes. 2. Over med-high heat, melt 1 tbsp of vegan buttery spread. Add your mushrooms, onions and optional celery to that. 3. Next add in your orange juice from 1/2 orange, 1 Tbsp apple cider vinegar and a nice pinch of saffron. Saute until saffron blooms and mushrooms become tender. Add a small handful of parsley and remove from heat. Transfer to a separate container and set aside. 4. In the same pan, add a tsp of olive oil and 2-3 Tbsp maple syrup. 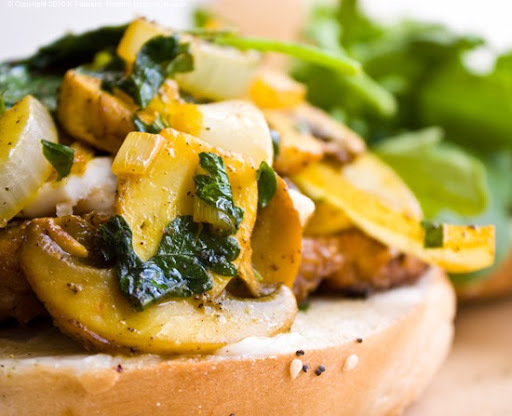 Add tempeh. Saute a bit and add in the rest of your orange juice and apple cider vinegar. 5. Saute for about 2 min on each side. If adding cheese, add it over top the tempeh and melt gently. Add salt/pepper to taste. 6. Slice and toast your bagel. You can add a smear of berry jam or Vegenaise spread to each side of your bagel (optional). 7. 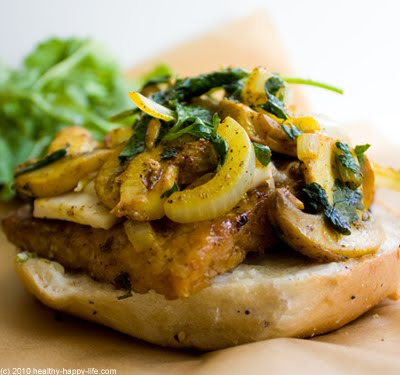 To the bagel, add two slices of tempeh, a big spoonful of your saffron mushroom mixture and a handful of raw arugula. A pinch of pepper on top. 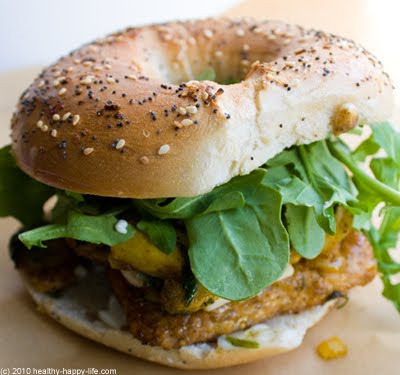 Slice bagel and pack to-go, or eat at home. A side of fresh OJ or other fresh citrus or tropical juice (pineapple, grapefruit, papaya, tangerine) goes perfectly with this bagel.